Get high in the Peruvian Andes during a visit to Cusco, metaphorically that is, as this ancient Incan capital perches at an oxygen-thin 11,152 feet above sea level. It would be a mistake to view Cusco only as a gateway to the Sacred Valley and Machu Picchu, and not allow some time to explore. The city boasts an intriguing mix of Incan treasures from its days as the capital of the empire to Baroque churches and palaces built by the Spanish invaders in the 16th century. With fun shopping, delicious food, historic hotels and an abundance of culture and tradition we loved our few days in Cusco. Stay: Our first choice, The Inkaterra La Casona, was unfortunately booked. An elegant Relais Chateaux with only 11 suites you need to reserve well in advance for a chance to stay in this 16th-century manor house. However, just across the small colonial square are Cusco’s other top properties, Belmond’s Hotel Monasterio and Palacio Nazarenas--you can’t go wrong with either choice. We stayed at the Monasterio, also a 16th century monastery that is both historic and luxurious. The highlight was the stunning colonial courtyard nestled amongst the cloisters with awesome views of the surrounding hills; an ideal location for breakfast each morning. Every room is different, and some can be quite small, try and reserve in the main building and if you can splurge on a suite. Oxygen is piped into approximately half the rooms to help combat altitude sickness --if this is important to you inquire when you make your reservation. Though we paid the extra small charge thinking why not, some Peruvians we met say its hogwash. 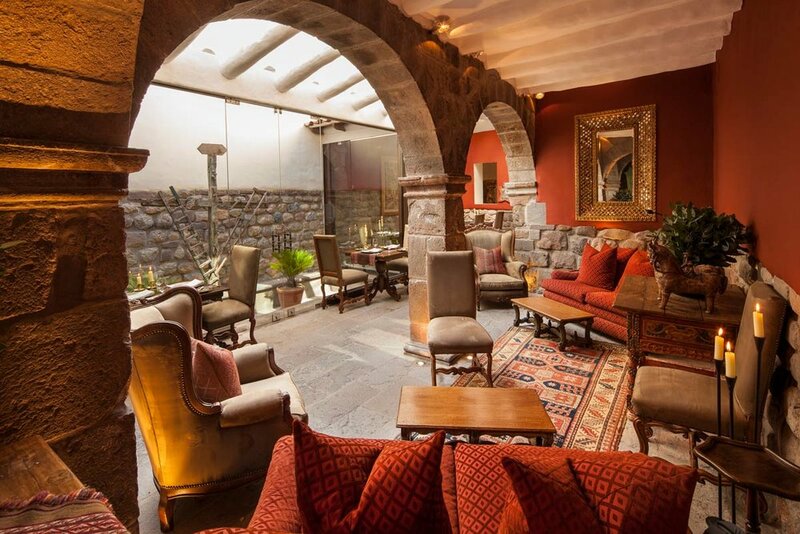 Adjacent to the Monasterio, Palacio Nazarenas is a former private residence and convent, beautifully restored with original colonial frescos and Incan stonewalls. The lovely swimming pool is a draw, and some like that it’s a smaller property than its next-door sister with 55 all-suite rooms, compared to the Monasterio’s 122. Let's Go: The Plaza de Armas is a mandatory first stop, Cusco's main square and heart of the city. It’s always full of action and a great place to watch the daily dance of life in Cusco. Two Magnificent churches anchor the plaza: the Cathedral del Cuzco and the Iglesia de la Compañia de Jesús. Don’t miss the painting of the Last Supper in the Cathedral with a Peruvian twist, depicting Jesus and his disciples dining on a traditional Peruvian meal with the centerpiece a cuy, that’s right a guinea pig. (Guinea pigs are native to Peru and you’ll see them on many restaurant menus.) You’re sure to pass many women on the plaza and surrounding streets dressed in indigenous attire with llamas and alpacas in tow, the animals are photo accessories, and for a small fee, you can pose with one. One morning we watched a teen dance group practicing outside the church while later in the afternoon we enjoyed a band performance. Stores and restaurants line the plaza nestled under the arches with views of the city and hills as a backdrop. It’s atmospheric in spades. Top Tables: Our hands down best meal in Cusco was at Cicciolina, located on the second floor of an old Spanish colonial house just two blocks from Hotel Monasterio. We loved everything about it—the atmosphere, friendly service and most importantly the delicious food! Everyone you ask will tell you to go to Ciccolina and now we know why. If you want something light, you can also sit at Ciccolina’s bar and graze from the tapas menu. MAP Café is the other talked about restaurant in town, stylishly set in a glass cube in the courtyard of the Pre-Columbian Art Museum. MAP is a fine dining establishment with only 14 tables It books up quickly, and we had no luck getting a table during our stay, even though we tried a few weeks in advance! More Eats: We enjoyed the food and trendy ambiance at Kion for Peruvian/Chinese fusion. An order of the Chaufas, a Peruvian fried rice dish is a must for the table. Another night we ate at Limo with an enviable spot overlooking the plaza, especially magical at night. Limo is part of the same restaurant group as Kion and specializes in Japanese fusion. (Note: We all preferred Kion.) We also enjoyed La Baco, Ciccolinas more rustic sister restaurant, known for BBQ meats and mud-oven pizzas. If you're looking for something other than Peruvian for a change, a local told us she likes Bodega 138 for pizza, pasta, and beer. We didn’t have more time but wanted to try Papacho’s, an open-air restaurant with a lovely patio –if you're adventurous this is the place to try local specialties such as cuy or alpaca steak. Drink Up: You’re going to drink a lot of Pisco Sour’s during a trip to Peru—after all it’s the national cocktail! The drink's name comes from its base of pisco, like a brandy, mixed with a sour citrus juice and some sugar sweetener. There’s no better place in Cusco to learn about it than at El Museo de Pisco during a pisco tasting. Don’t be fooled by its name; this is not a museum but a bar. It’s really fun, and you can learn all there is to know about pisco! Shopping: To be honest, shopping was our main agenda while in Cusco—so much so that we all packed an extra small duffel. If you're looking for high fashion than you’ll be disappointed but if artisan, bohemian textiles and accessories are what you are after then get ready! We stocked up on ponchos, scarves and gloves, silver dangling earrings and fun, summer “hippy” bags. Cusco is a perfect place to buy Christmas or birthday presents to stow away for friends and family back home that are unique and fun. Start your hunt right outside the Belmond Hotels in the Plaza Nazarenas, there are many high-end shops right on the square, as they cater to the clientele of the three hotels. Inside the Pre-Columbian Art Museum, also on the plaza, is a wonderful weaving store, run as an NGO called Centro de Textiles Tradicionales del Cusco. In addition to being a worthy project, they have beautiful pieces. Kuna is a chain throughout Peru, with a focus on alpaca wool pieces of excellent quality. You will find two locations on the main square, and each tends to have different pieces. Close to the main square, we found a store we all really liked called Altiplano Collective. They have beautiful artisan products and also a great mission—profits support the local communities that produce the goods. There’s no website but here’s the address so you too can find it: Sta Teresa 321. If you are looking for silver, Ilaria has some great pieces. ﻿Wander: San Blas is Cusco’s artisan, free-spirited neighbored just a short stroll from the central plaza. Walk up Cuesta de San Blas and explore the shops along the way. We particularly liked A la Lau amongst a few other spots. Don’t miss the main square--walk above the fountain for a great view over the city. On the way back down take Calle Carmen Alto- to visit more quaint shops and galleries. Keep your eye out for L’atelier, but its fun to make your own discoveries. Ruins: It’s a nice walk or quick taxi to Sacsayhuaman, the impressive Inca fortress that sits high above the city. We taxied there and then rambled back into town, a 30-40 minute walk. Sacsayhuaman was both a religious site and the grounds for a deadly battle between the Inca army and the Spanish conquistadors. Licensed guides are available at the entrance for a small fee to show you around the impressive remains. The tour was approximately 45 minutes and well worth it. You can’t help but be in awe of the engineering skills of the Incas; the fortress has staggering stonewalls constructed across three levels in a zigzag formation, all fit perfectly together with no mortar. It is believed more than 20, 000 men worked to transport the stones from quarries over 20 kilometers away, not an easy feat as many of the rocks weigh in at more than 100 tons. An added plus--the absolutely stunning views of Cusco from the site! More Sights: Near Sacsayhuaman visit the Planetarium to learn about Incan astronomy. Delve even more into the Incan empire’s history at the massive Inca Museum housed in an impressive colonial home. Other worthy sights if you have more time include the Museo de Arte Precolombino, Museo de Arte Popular, and Museo Machu Picchu. Sweets: Chocolate fans add Republica de Cacao to your list for delicious local chocolate. (You can also find this store in the airport in Lima.) Try the combinations using quinoa; we loved the crunch it added. Food Markets: The San Pedro Market is one of Cusco’s largest and busiest markets just a few blocks up from the Plaza de Armas. From veggies and fruits to coca leaves and teas to all kinds of animal parts to souvenir finds this is a colorful and vibrant market. Tips for Travel: Cusco sits at an extremely high altitude, and many people experience shortness of breath, fatigue, dizziness, sleep restlessness and even nausea. We were coming from the Sacred Valley, which though still 9, 500 has a lower altitude than Cusco--allowing us to acclimate for a few days. Listen to the locals and the guidebooks: drink lots of water, take it easy the first day or two, avoid alcohol, don’t eat heavy meats and chew coca leaves throughout your trip. There will be plenty of time for pisco sours once your body adjusts. FYI: Is it Cusco or Cuzco? According to Wikipedia “there is no international, official spelling of the city's name. In English-language publications both "s" and "z" can be found.” Today the “Cusco” spelling is used in Peru, so that’s what we went with!